PS.R1 series balances represent a new standard of precision balances. They feature a new, readable LCD display which allows a clearer presentation of the weighing result. Besides, the display has a new text information line allowing to show additional messages and data, e.g. product name or tare value. New PS.R1 balances, like previously designed PS series balances, have pans in two possible dimensions: 128x128 mm or 195x195 mm. Balances with a smaller pan have a draft shield. They were equipped with the system of external mass adjustment. 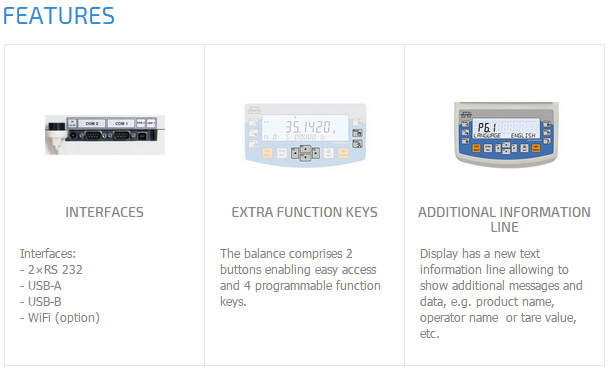 PS.R1 balances feature several communication interfaces: 2 x RS 232, type A USB, type B USB and optional WiFi. The housing is made of plastic, and the pan is made of stainless steel. The balances have a possibility to weigh products out of the pan (under hook weighing) - the load hangs under the pan.